We've talked a lot about dermarolling at Byrdie HQ—especially after news editor Victoria Hoff told us how grazing the cylinder of needles over her under-eyes permanently removed her bags, our jaws all collectively dropped. Once we picked them up off the floor, it was time to foray into the world of microneedling (as it's also often called) ourselves. If you're lost as to why anyone would roll needles over their face, allow us to bring you up to speed: According to Kerry Benjamin, founder of Stacked Skincare, creating tiny punctures on the surface of the skin helps it to go into collagen-production overdrive, thus thickening the skin, camouflaging dark circles and filling in fine lines. It also allows for serums to sink in deeper (which, by the way, you should be applying before and after dermarolling, but pay attention to ingredients, as retinol and vitamin C can gravely irritate punctured skin). I've been dermarolling once a week for the past few months now, and I've noticed a marked difference in my overall complexion and the dreaded fine line on my forehead (which turned into a very faint impression). But as much as I love using my regular tool, I recently came across a game changer: GloPro's Microstimulation Facial Tool ($200). 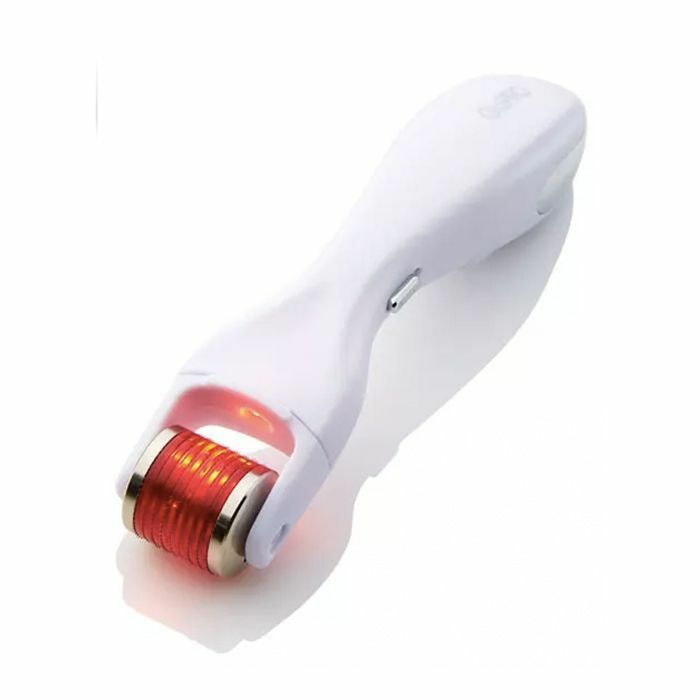 In addition to the typical advantages of using a standard dermaroller, the GloPro is electronic and has the added benefits of red-light therapy and VibroTactile Stimulation. Red-light therapy, as you may know, is anti-inflammatory and helps boost collagen, making it a great weapon against aging. Furthermore, the slight vibration element sends energy into the deepest layers of the skin, stimulating those layers without being invasive. After just one night of using the GloPro, I noticed a major difference in the depth of my forehead line, which had started to come back a bit after a brief dermarolling hiatus. Even the little period-induced breakouts I had on the side of my nose were notably smaller. Several uses later, and I'm totally hooked. What's even cooler is the tool comes with an assortment of attachment heads, like a wider roller to use on the entire body. This helps visibly smooth and firm the skin, especially for those experiencing crepey skin above the knees and on the back of the arms. (I personally didn't try this yet but will keep you all posted.) If that wasn't great enough, there's also a tiny under-eye attachment so you can target that sensitive area with ease. So tell us: Will you give this tool a try? Let us know in the comments!